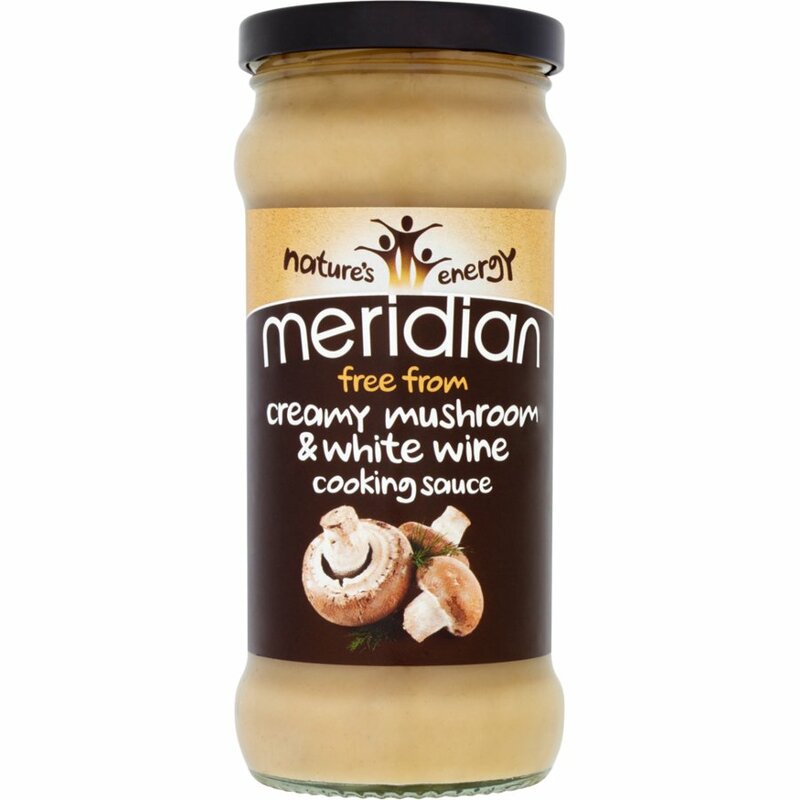 This creamy Mushroom, White Wine and Herb sauce from Meridian is made from specially selected ingredients, totally free from dairy products, wheat & gluten. This sauce can be used in a wide variety of dishes, suitable for meat, fish vegetables and quorn, either accompanied by wheat free pasta or rice. Dietary Attributes: Gluten Free, Dairy Free, Yeast Free, Refined Sugar Free, Egg Free, Vegan, Wheat Free. Water, Mushrooms (10%), Sunflower Oil, White Wine (6%), soya flour, Onion, Glucose Syrup, Maize Starch, Salt, Porcini Powder (0.7%), Lemon Juice Concentrate, Garlic, Stabiliser (Xanthan Gum), Vegetable Bouillon (Salt, Sugar Potato Starch, Yeast Extract, Onion Powder, Dried Parsley, Celery Extract, Onion Extract, Parsley Extract, Turmeric Extract, Acidity regulator: Citric Acid), Black Pepper, Parsley, Marjoram. Product contains soya and Celery. Not suitable for other nuts and sesame allergy sufferers. The Meridian Creamy White Wine and Mushroom Sauce 350g product ethics are indicated below. To learn more about these product ethics and to see related products, follow the links below. There are currently no questions to display about Meridian Creamy White Wine and Mushroom Sauce 350g. Meridian foods have been producing wholesome, organic tasty foods using the finest, most authentic ingredients from all around the globe. Based in the rolling Welsh countryside, Meridian have been producing high quality healthy food for 30 years, and are continually expanding their excellent range to meet the demand of the ethical consumer. All their products are suitable for vegetarians, and many are suitable for vegans, diabetics and those with food allergies. Meridian believe that eating a healthy, organic diet, should not mean you have to compromise on taste and variety. Meridian use the maximum in innovation and modern environmentally friendly technology to produce their foods, whilst also using only the best natural ingredients and ensuring their organic range is certified by the Soil Association.